A little over 2 ½ years ago, a group of committed SigEp alumni launched the Second Century Campaign for Nebraska Alpha. Built on the strength of the SigEp Brotherhood, and a significant lead gift from Glenn Korff, the Campaign aimed to raise $3 million for an addition to and renovation of our nearly 90-year old Chapter House. The goal was nothing short of matching our best in class Brotherhood programs with a best in class Chapter House. It is time to celebrate our success. 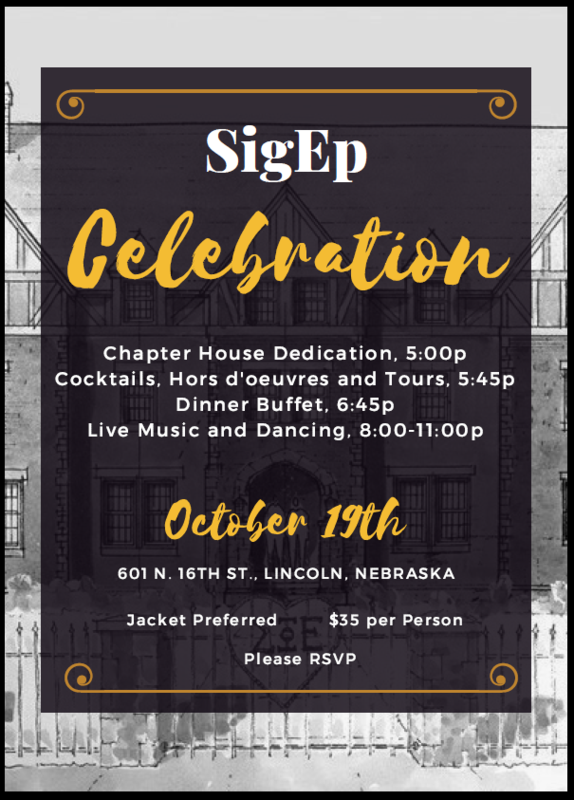 Please join the SigEp Brotherhood on October 19th at 5:00 for the Dedication of the renovated Chapter House. The enclosed invitation contains the details. We are honored to announce that the Chancellor of the University of Nebraska-Lincoln, two members of the Board of Regents, and the CEO of Sigma Phi Epsilon will join us for the Dedication. This will be the most significant Nebraska Alpha event since the Centennial Celebration in 2011. What a perfect time to reconnect with the Brotherhood. We also have some very exciting news to share. The Glenn Korff Foundation has donated a matching grant of $250,000 to the Campaign. By raising another $250,000 from our alumni, we will have completed this significant Campaign, the largest of any SigEp House in the nation. Our Trustees invite you take part in supporting the Campaign with a gift and by attending the celebration of our success on October 19th. Every gift matters and each gift is literally doubled in impact due to the matching grant. We will be recognizing gifts to the Campaign with a beautifully framed donor recognition plaque that will be displayed at the House. A pledge form is enclosed so that we may properly recognize your gift. Please call or email a member of the Steering Committee if you have any questions about the Campaign. We look forward to seeing you all on October 19th. What a great time to be a SigEp!!! Change is the law of life. And those who look only to the past and the present are certain to miss the future.